5:2 Food for the Family. Roasted tomato, spinach and yoghurt pasta sauce. The 5:2 lifestyle comes in a range of varieties. The original was 500 calories for women and 600 calories for men on 2 non-consecutive fast days a week. Dr. Michael Mosley has recently revised this to 800 calories as almost as effective and more achievable for some people. There is also a potential split between whether this is achieved in one meal or across two. When I’m at home I am just as happy to eat dinner only but when I’m at work I prefer to have lunch and dinner. So this meal is a little higher in calories than most of my 5:2 meals, we eat it on non-fast days. 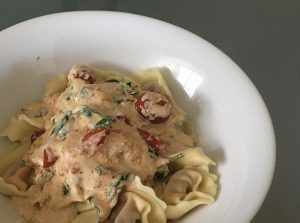 This meal came in at 546 calories/serve using Casa Barelli tomato and mozzarella tortellini (363 calories/serve). The sauce itself is 213 calories so you could reduce the total with a different pasta (wholemeal being a better choice). Roasted tomato, spinach and yoghurt pasta sauce. Place 1 punnet of cherry tomatoes, 3 whole cloves garlic and 4 small quartered tomatoes in a baking dish, drizzle with three tablespoons olive oil. Slow roast for 1 hour until collapsed and browning around the edges. Remove garlic and squeeze out of its paper, back into pan. Toss together on stovetop over low flame until spinach is wilted and yoghurt heated through. Serve on top of drained pasta.